“You got me in my gardening hour”, smiles Howard, as we sit down in the bright kitchen of their Clunes bungalow. His vowels still reveal a touch of the classic New York twang even after 27 years in Australia. “I forced him to change!” says Elle, who is originally from Amsterdam where she and Howard met 42 years ago. Together the couple have three children and five grandchildren, and have helped pioneer the local organic herb industry from where we are now sitting. 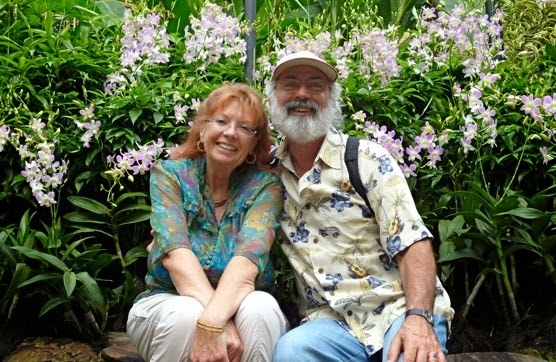 Howard Rubin and Elle Fikke came to Australia during the open-door immigration policies of the 1970s and 80s, hoping to start a herbal tea business. Having sold everything in the UK, they went on holiday to Bali, met some friendly Aussies there, and turned up in 1987 to a house in Tuntable Falls which had been arranged for them by some herb growers in Nimbin. “They made you feel welcome”, says Elle, “it was really nice, and so easy for us to come and stay here”. While still on tourist visas, the pair started a business with two local guys, which the government found out about. The two business associates rubbed their hands together, thinking they would take over the venture and never see Howard and Elle again, but they were back in the country within a week, the Australian government having arranged their exit and re-entry with a minimum of fuss, passports stamped and papers in order. Weekends spent with friends in Clunes led to the purchase of a 1-acre block amongst a mango plantation being subdivided behind the Clunes Store. Hidden away at the end of a dirt track (now Smith Street), Howard and Elle began their own herb farm, running courses and setting up a co-op to encourage other small growers in the area to get into herb cultivation. The Organic Herb Growers Association was born; a volunteer group that met around Howard and Elle’s small dining table and pooled their harvest to send to market in the capital cities. This association grew steadily and gained approval to become a certifier of other organic producers. Through a few incarnations over the next 15 years it eventually became Australian Certified Organic, the largest organic certifier in Australia today. “We came at a really unique time, multiculturalism was just starting to happen”, says Howard of their fortuitous timing. “It was a period of renewal, people were curious and wanted to try new things. Herbs like thyme, basil and lemongrass were suddenly in vogue”. By the early 1990s herb production had taken off in the Northern Rivers, and increased competition from neighbouring growers and the introduction of the GST put financial strain on their small operation. To keep afloat, and “ahead of the many, many” as Howard puts it, they began Koala Tea, using the network of growers they had built up locally, and sourcing organic produce from around Australia. These days their teas travel abroad more than they do, to clients all across Asia and to the USA. Koala Tea is even drunk aboard the Sea Shepherd vessels where, apparently, the Balance tea is quite popular! Howard insists herbs are simple and easy to grow, even if you don’t have green thumbs, and they’ve made it their life’s work sharing this passion with others. He and Elle seem adept at anticipating every challenge this career path has presented them, so it's fitting that his current favourite blend is called No Worries.